A key feature of the Alexander Palm is its capacity to tolerate heavy inundation under heavy rain events. 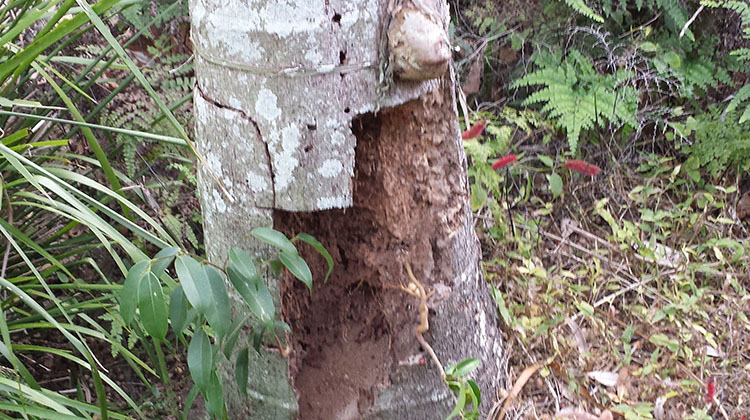 This survival quality has made the palm a dominant species in tropical Queensland. 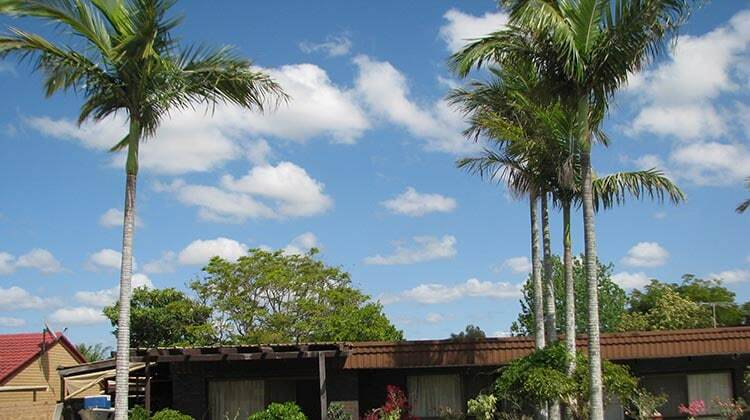 It is not locally native to Brisbane so the similiar Bangalow palm should be planted instead. Favoured for its beautiful shaped and clean visual appearance compared to some other palms, the Alexander has been cultivated for gardening and now grows prolifically across Southern Queensland and areas of northern New South Wales. It will grow to an average height of 15 metres. Spectacular in outdoor environments, this is a palm that can also be grown in pots in semi-indoor environments such as covered courtyards and patios. At full maturity, Alexander Palms have a tall, slender trunk that tapers from a 50-60cm width at the base of the tree to a 25-30cm width at the top. They are crowned with up to a dozen, long leaf fronds that cluster at the top. Pale grey and with just-visible leaf scars yet tidy due to the palms’ self-cleaning characteristics. The trunk of the Alexander Palm is slightly bulbous. Alexander Palms sprout hanging tendrils of white or purple flowers that appear after their three bract enclosures open during spring. The flower clusters are often 1 metre long, with a width of about 50cm. Both male and female flowers are present in the clusters. Flowering below the crown shaft on a clean trunk, the Alexander Palm displays a necklace effect when in bloom. The leaves have dark green upper surfaces with a pale, white underside. They are twisted, rather than flat and carry 60-80 leaflets per 4.5 metre stalk. The base of each stalk is bright green in colour and extends 1 metre throughout the crown shaft. This firm attachment allows the Alexander Palm to securely hold its leaves, even during tropical storms with high winds. Although pointed at the tip, the leaves do not have the spikes of sharp edges common to some types of palm. Initially green, the trees’ fruit develops a bright red colouring as it ripens. This fleshy covering drops and the fruits open to reveal fibrous brown innards. Promoted as a replacement to Cocos Palms, which produce a fruit toxic to many Australian native animals, the Alexander Palm had for a long time seemed a safe alternative. However, given the giant seed harvest per plant and successful seed dispersal methods, it is now spreading from cultivation to infest waterways and riparian areas. Alexander Palms propagate from seed with germination occurring in as little as six weeks. Seeds are ideally sown in spring in areas of partial shade to full sun. The trees will not tolerate frost, especially at the seedling stage. This can be managed by developing juvenile tree in indoor pots before transferring to the garden. Birds and animals assist in the propagation of Alexander Palms but it is likely their seeds are dispersed in waterways and through dumped garden waste also. Preferring acidic soils, the Alexander Palm should be fed an appropriate palm fertiliser to maintain health. They should also be mulched but with the mulch kept away from the very edges of the trunk where it could encourage rot. Soils with good drainage are also necessary to prevent rot in the trees’ root system. While drought tolerant, the plants respond to generous watering. Bugs and insects can be a problem for these palms and they can become infested with spider mites, leaf spot or other palm insects. Fast growing, the expected rate for a specimen kept in suitable conditions is 1-1.3 metres per year. A popular planting method for this variety is to crowd two or more seedlings into one hole. This encourages the trunks to turn away from each other during development and gives a stylish spread effect to parks and gardens. We now recommend removal of alexander palms from house blocks located near environmentally-sensitive areas such as bushland and creeks. They are categorised as an environmental weed due to displacing Brisbane’s native bangalow palms. Hi there, I have a row of palms near my property boundary which I now want yo fence. My only concern is how close I can fence to the palms. The palms are already at an approximate height of 3m and with a width of about 0.3m at its widest point at the base. Will the palm continue to get wider? How long do Alexander palms live and what happens when they reach their full height? We have two in our front yard which would be approx. 15 years old – I’m not sure how tall they are but taller than our one-storey house. Hi we have cut down Alexandra palms . We have elks attached & want to keep them on the tree. Should the stumps be cut on an angle & what product can we use the so paint on top to stop the rot so we can keep our elks attached. Apparently they use a white product in thailNd to stop the rot?? Hey there. I live south of Houston Texas. We have occasional frost. Are there any types of King palms that can take cold better. I read I might have better luck with Bangalow. Any advice? Gday Kurt. True, bangalows are known to be frost-tolerant while Roystonia’s aren’t. I’d go with the bangalow for that reason and others: Roystonias, while magnificent, drop their enormous fronds without warning. Of course, whether that’s a problem may depend on whether you plan to sit under the tree. Help we have 20 Alexander Palms on our property all at least 15 metres high. We noticed one which has 3 forks has collapsed its highest fork frongs straight down. The frongs were ok previously and it seems to have done it over night. We are in near drought conditions at moment. All others are at this stage looking ok. I have given it more water and have palm food ready to give it but was advised not to until it picks up. What could be the cause? I can take a photo and send it on. Hi Christine. Sorry, but your palm won’t recover from that. Can Alexander Palms be grown in Adelaide near the beach (no frost)? Hi Stuart. Yes, they should grow there without any particular problem. Hi there. I just purchased 3 single Alexandra palms however was after a double & a single. I wanted the double as I like how the grow with a curve shape away from each other. The advice I was given was that I could plant 2 very close to each other to get this effect however, I’m worried that they may be too established already. Is it possible to get this effect with established palms or do the need to be planted as seeds close together? Any advise would be appreciated. Hi I live in the Netherlands and was given an alexander king palm as a gift. I have several different palms, all growing indoors and doing well but my king palm is growing really slowly. It’ has 3 shafts, each with about 3 leaves & only just 1meter tall. I would love some growing tips, what temperatures, how much sun/light, water & fertilizer would you advise? Please can you tell me the safest distance away from the house I can plant Alex palms and Golden Canes. I am concerned about the roots sucking up moisture and causing damage. Hi Steve. You’re right to be concerned, and you’re right about the reason, too. When short of water any tree can cause soil shrinkage leading to damage to foundations. How far the tree needs to be from the house depends on your soil type, so you’d have to refer to the soil test carried out before your house was built or order another one. Sorry I can’t be more specific, but it really is soil dependent. I have a clump of three Alexander palms approx 1.5 metres in height. Over the last six months all three have been deteriorating IE new growth has been pale in colour and the leaves are stuck together. I treated them for what I suspected as mealy bug however there has been little improvement. They are growing alongside a limestone block wall and I considered this may now be the problem. Your comment of the acidic soil requirement confirms this possibility. Of all the sites I visited this has been the most informative-thank you.